Once the mileage creeps up on your runs the money spent on all those “miscellaneous” items can creep up too. 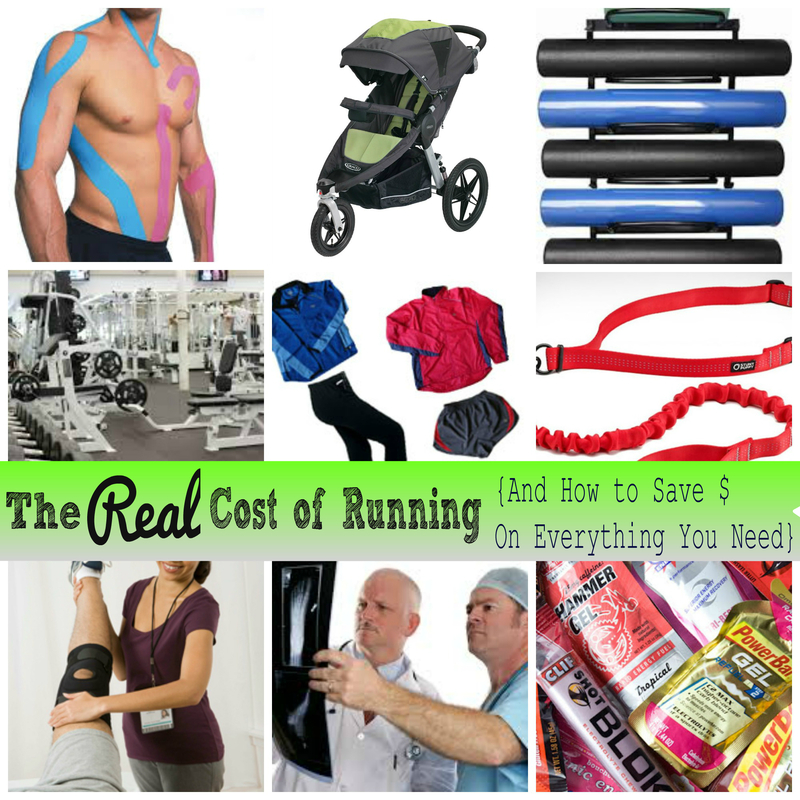 We’ll explore the real cost of running and how to save money on the products you need. Sports Tape: Also known as KT tape, Rock tape or sports tape, this tape is absolutely beneficial when little injuries pop up. It’s been crucial to helping me keep running on those weeks when I push it a little farther and my body reminds me of it. Save money by buying your sports tape on eBay or Amazon. Injuries: Even the best of runners will get an injury from time to time. If it’s serious, expect trips to an orthopedic surgeon or physical therapists. My suggestion is to really encourage family members to go into this line of work to save you money. If that doesn’t work than I don’t know what to tell you. I have been known to call my physical therapist ahead of an appointment to tell him exactly what I needed from him so I didn’t feel my appointment was wasted. I’ve had some that “just want to get to know you by taking it easy” for $250 on your first visit. I don’t want to visit–I want to get better and get on my way! Give me homework–exercises! Watch my form–Record and tell me how to improve! But don’t just work on a few stretches and shoot the breeze. I’m a motivated patient. When I come to see you I’m generally at the end of my recovery period and ready to get out and on my way again. Diet: I can’t tell you how many times I’ve heard in different clinics that if you don’t eat well you can’t run well. A good diet is important to keep your body fueled well during longer runs but for some reason whole foods like to cost alittle more than packaged foods. It’s really sad though that I’m known at my local Sprouts as the coupon lady of health food. Shop sale ads too. It helps to save a lot of money. Shoes: The more you run, the more you rotate out shoes. And the more you rotate out shoes, the more expensive it is. To save costs, shop online for your favorite shoes or find a running store that will price match. (My local running store does that and they love me because I usually procrastinate on buying shoes until I absolutely need to and don’t want to wait for shipping). And don’t forget the compression socks and stockings! And the socks. Clothing: When your mileage gets longer and you’re out rain, snow, sleet and sun you’ve got to have the right clothes. I buy a lot of my clothes on clearance. In fact, I probably buy 90% of my clothes on clearance. The other 10% my husband bought for me. Because I couldn’t find it on clearance. Supplements: I love this. Everytime I go online it’s interesting to see that there is a different supplement to help your runs. Glucosamine has been around for a long time–it’s good for the joints. There’s also B12 (my friend swears on getting the shots), iron, calcium and more to keep the body in tip top shape from the inside. We love saving money by using coupon codes for online retailers. Equipment: I see runners run with just about….everything! Hydration belts, running belts for dogs, headbands, backpacks, earphones, phone holders, jogging strollers…everyone kind of has their “thing.” And then there are the foam rollers and balls and orthotics and Gu chews and Stingers that are there to help you for during and after your run. Look for clearance, do a search online to see if you can find it for less expensive somewhere online before paying steep retail prices. I’ve even written to companies to see if I can get samples of their products before spending money on them. I’ve had a lot of gross in run supplements. Samples are great! Did I miss something? Is there something that you absolutely can’t live without? How do you save money on the exercise products you love?